The Mini Tricopter is now available on the store! The Mini Tricopter, a different mini multirotor that packs a punch. The Mini Tricopter was designed to utilise parts from the Tricopter V3. It uses the same Naze and PDB, servo, tilt mechanism, motor mounts, front spacer and arms (cut to half length). Which means that you can convert your regular size tricopter to a Mini Tricopter simply by cutting the arms (or getting new pre-cut ones) and screwing on the Mini Tricopter add-on frame. (Warning: cutting carbon fiber is dangerous and may harm your health. Use proper protection if you try it.) Also, don’t forget to downsize the electronics accordingly. Flying the Mini Tricopter can be best described as driving an overpowered rear-drive car. It’s not the fastest around the track, but you’ll have the biggest grin on your face when the race is over. The recommended electronics package makes this little beast go almost 160km/h (100mph). The thin arms and smallish body makes it pretty aerodynamic slippery. It requires very little power to cruise at high speeds and it absolutely loves long low-passes with big wide turns. Flips, loops and rolls are quick and crisp thanks to the center of gravity and center of mass being very close to each other. Transporting the Mini Tricopter is really easy as the arms can be folded back, just like on the larger tricopter. Folded up it’s only 10cm wide and 30cm long (35cm with 6 inch props sticking out straight back) and 8cm tall. The folding design also makes the Mini Tricopter crash resistant, as the arms may fold back, absorbing energy. The tough “cage” protects the electronics and battery on the inside. I would like to thank the awesome community for stepping up and making the mini tricopter as good as it now is. Tricopters have received very little love in the development of modern flight controller code. With the Mini Tricopter this became very obvious as the yaw performance in the original Cleanflight code was lacking. The user Lauka, on the forums, wrote a special Tricopter version of the Cleanflight code called “Triflight”, which with it’s many alterations, already has improved performance greatly. You can join us in this quest for perfection simply by posting your findings in this thread. Together we can bring back the tricopter with it’s phenomenal flight characteristics from the brink of extinction. Yay! It would be cool if you also were selling LiPo’s, but I suppose transporting energy cells is subject to some legislation? Are there gonna be further batches like Tri V3 for those wishing to grab another one or repair damage from crash? Thanks a million for all your work david! I can’t wait to feel this thing in the air! 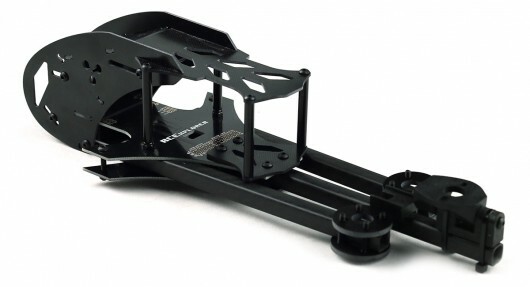 David, what is the weight of Mini Tricopter add-on frame? Will it affect flight time of a Full Tri v3 significantly? Will probably cost you 15-20 seconds or so. Awesome!!! A beautiful mutation. Thanks David! Just what I’ve been waiting for, thank you David! Hi! Can you show us how is add-on mounted on front end? Picture coming soon. Trying to get the build video done. Man is this thing cool! I cant wait to get this Tri into my hands. At the moment I am flying a EchoQuad 270 and it flies like a dream ,but from the start i’ve always wanted a tri from David. I find that racing is more to my liking, so a Racing Tricopter!!! Now that is just PLANE cool! Is that correct ? Even with oneshot we normally dont go lower than 1600 ? 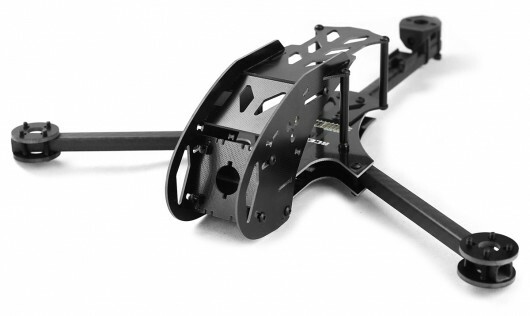 sorry my mistake … just came across this ..
What’s the weight of the frame (integrated Naze32 and PCB) including the servo tilt mechanism? Just had the maden, went good! What an amazing machine!! Thanks for designing, making and selling it! Tomorrow first time FPV, bit nervous, but will be cool :)! David, high and happy new year. Is there any chance you can kindly post a few images of an assembled mini trip, to show the camera and battery positioning and attachment please? Thanks, Mike.